I recently had an article published in the German publication Internationale Politik for their September/October issue. The piece was titled “Debating the Global Jihad in Cyberspace.” I figured since it was published in German I would post the English version here. It should be noted, though, that parts of the article were edited in German following my final version of it written in English so there are some differences between the two copies. Also, this final English draft was completed August 8 so some of my own analysis of potential debates regarding 9/11 were future prognostications rather than content based on knowledge from the past week since 9/11. Additionally, for those wondering why I didn’t have anything about the debates on HAMAS and Hizbullah, I felt that they had already been treated fairly well in the literature and decided to leave them out of the piece due to the word limit. Since 9/11 and increasingly over the past several years, online jihad has become just as important to the global jihadi movement at the grassroots level as its military operations. There have been vigorous debates in the past decade amongst jihadis in forums and via official communiqués released online from popular ideologues as well as leaders. However, there have been instances where such debate was purposely shut down by administrators at forums to keep a sense of ideological cohesion. As a result, because of a lack of mainstream coverage the global jihadi movement is viewed in monolithic terms even though there are indeed cleavages that arise every so often, although they do not create big enough rifts to endanger the movement. It would not be surprising to see global jihadis writing ten-year retrospectives on the 9/11 attacks that turn into vile debates. This could certainly be a replay of global jihadi debates that immediately followed the 9/11 attacks about whether it made sense strategically to attack the United States versus focusing on the so-called near enemy. In light of the recent Arab uprisings and the potential opportunity to gain power, one might very well see the debates over the far and near enemy to re-emerge. Although there has been a so-called hybriditization of these strategic outlooks, as Thomas Hegghammer has argued, one could see a decoupling, with a return to the local battle since, in the current context, it may bear more fruit. In a related fashion, the most recent of these debates has dealt with how global jihadis in Arab countries should react and/or participate in the continuing uprisings against unpopular regimes. Many online jihadi ideologues have been cautious because the peaceful demonstrations are a rebuke of the global jihadis’ strategy of using violence as the most effective way of bringing about change in those societies. For instance, in late July 2011, a joint statement was released by top-tier global jihadi forums (al-Fida al-Islam, Shmukh al-Islam, and Ansar al-Mujahidin) and online jihadi media apparatuses, calling for its followers on the ground in Syria not to carry out military operations. Moreover, many global jihadi activists on the ground have been curious about the legitimacy of joining the protest movements going back to January 2011, when the Arab uprisings were in their genesis. For example, Minbar al-Tawhid wa-l-Jihad’s Shari’ah Council regularly fields questions and publishes fatwa’s (legal rulings) in response. Questions from activists on the ground ranged from the legitimacy of self-immolation alá the Tunisian Mohamed Bouazizi, who helped spark their revolution, or the efficacy of joining the street demonstrations in countries from Morocco to Egypt to Iraq to Saudi Arabia, and others. They also consider whether it is legitimate to join al-Nahdah, a Tunisian Islamist organization, or to participate in the Egyptian referendum and elections, or whether it is permissible to establish a political party. Another important question that has been raised is whether the demonstrations discredit the “mujahidin.” Also, many organizations, as well as other ideologues, caution the jihadis on the ground not to let deceitful protesters steal any progress in the jihad or establishing the shari’ah. As far as participation goes, this debate echoes earlier debates, though in a different context – at the onset of the United States’ war in Iraq. ‘Abd al-Aziz al-Muqrin, the deceased former leader of al-Qaeda in the Arabian Peninsula (AQAP) – which at the time (2002-2006) was located in Saudi Arabia and a different entity than AQAP currently in Yemen – debated the legitimacy of having Saudi Arabians joining the jihad in Iraq. Muqrin believed that the jihad in Saudi Arabia and Iraq could be symbiotic, where they complemented and reinforced one another, instead of just focusing on one area of operation. This differed from the view of one of the key Saudi leaders in the Chechen theater (among others) who released an audio message online, arguing that fighting the Saudi royal family was a waste of time because it fed into the machinations of the United States; instead, he advocated that it was worthwhile to focus on the United States’ presence in Iraq. Following Muqrin’s death in 2004, much of the support for jihad in Saudi Arabia dissipated due to set backs and the success and notoriety Abu Mus’ab al-Zarqawi’s al-Qaeda in Iraq organization garnered by that time – in large part due to Zarqawi’s innovative and sophisticated online apparatus. As with the above argument, many of the noteworthy debates that inspired discussion in the mid-2000s surrounded al-Qaeda in Iraq and its subsequent entity, the Islamic State of Iraq (ISI). A year prior to al-Zarqawi’s death in 2005, one of his former mentors, Abu Muhammad al-Maqdisi, who has been described as the most influential living global jihadi theorist and who runs the website Minbar al-Tawhid wa-l-Jihad, launched an attack against al-Zarqawi because of his excessive use of takfir (the practice of one Muslim declaring another Muslim an unbeliever or an apostate) and violence, as well as his lack of knowledge of Islam (along with his followers). Following the death of al-Zarqawi (in 2006), his supporters online (who have been described as neo-Zarqawists), especially individuals at the Midad al-Suyuf Forum – through 2010 – described al-Maqdisi as a sellout to the Jordanian regime – and one who went soft on jihad. Though, based on research from Joas Wagemakers and Nelly Lahoud, two leading authorities in the field of jihadi studies, al-Maqdisi’s writings have been consistent over the years. Also, the attacks against al-Maqdisi did not tarnish his reputation and is still considered by most grassroots online global jihadi activists as a popular and legitimate voice. Additionally, after the death of al-Zarqawi, al-Qaeda in Iraq decided to change its name to the ISI as a way of rebranding itself because many Iraqis were repulsed by its overuse of violence, as well as the perception that it was simply a group of foreigners. This is the reason they also announced Abu ‘Umar al-Baghdadi as their new leader to show it was a local movement – it has been disputed whether he was actually a real person. Though this became a cause célèbre for grassroot online global jihadi forum activists who started placing a banner at the top of the major forums stating how many days it had been since the announcement of the Islamic state, not everyone agreed with its decision. Popular and credible online shaykhs Hamid bin ‘Ali, a Kuwaiti cleric, and Abu Basir al-Tartusi, a Syrian cleric who is based in London, were the most vocal critics of creating an Islamic state. In January 2007, the ISI wrote a booklet “Informing the People About the Birth of the Islamic State of Iraq,” defending the state. ‘Ali and al-Tartusi, both in April 2007, wrote statements on their websites questioning the theological, strategic, and practical reasons for establishing the state. Further, the Islamic Army of Iraq (IAI), one of the other insurgent groups aligned with al-Qaeda prior to the declaration of the state, in late 2006 criticized this project and rebuked the ISI in an online statement in April 2007, which led major global jihadi forums, such as al-Boraq and al-Mohajeroon, to discontinue publishing the IAI’s media releases. The online fight got so intense that the al-Boraq Forum ended up splitting into two different forums each supporting its respective group. This topic was later revisited and dodged by Ayman al-Zawahiri, who at the time was the deputy of al-Qaeda Central (AQC) and who is now the current emir. In December 2007 al-Zawahiri invited grassroot online global jihadi activists at the al-Ekhlass and al-Hesbah forums to ask him questions via the forums to which he would respond. Many of the forum activists were concerned by questions over the legitimacy of declaring an Islamic state in light of ‘Ali and al-Tartusi’s criticisms as well as the excessive violence in Iraq. A study by West Point’s Combatting Terrorism Center, which analyzed all 1,888 questions, concluded that al-Zawahiri did not substantively answer any of these specific concerns. Though the ISI is still an entity, its project has been a failure since many local Iraqis were uninterested in following strict Islamic law and believed that the ISI was sowing fitna (discord), which led many local tribes and individuals to side with the United States, effectively downgrading the ISI to a nuisance versus an existential problem. Another war of words that played out over the Internet dealt with a split in the self-styled Caucasus Emirate, which is largely fighting an insurgency against Russia, but sympathizes with al-Qaeda’s global jihadi worldview. The Caucasus Emirate’s ideological fissuring, though far from unprecedented, played out in the near-total transparency of the Caucasus Emirate website the Kavkaz Center. Dokku Umarov first proclaimed the Caucasus Emirate in 2007, but in late July 2010 his leadership came into question. Umarov announced in a video that Aslambek Vadalov, the commander of the Eastern Front of the Armed Forces of the Caucasus Emirate, would succeed him immediately. Umarov said he strongly believed in the importance of clear lines of succession should he suddenly die. He urged his followers to pledge bay’at (a formal declaration of allegiance) to Vadalov. A week later, though, Umarov followed up his earlier message with a stunning announcement: he was recanting his resignation, the announcement of which he claimed had been “fabricated.” In a separate message released online that same week, Vadalov announced that he was stepping down from the position of deputy Emir. This feud went back and forth online through October 2010, when Umarov and the new opposition leveled charges against one another and they each attempted to shore up their positions. Umarov felt betrayed after conceding some of his failures in a high-level commanders meeting and offering to step down, but when the video that announced Vadalov as his successor contained an added statement from Vadalov, alongside two other senior leaders: Khusayn Gakayev and an Arab, known only as Mukhannad, who was reportedly al-Qaeda’s liason in the North Caucasus and died in April 2011. In early October, two videos that had been originally recorded in August surfaced, detailing a growing rift between those loyal to Umarov and a breakaway contingent that had joined with Vadalov. In the first video, Vadalov, Gakayev, and a commander named Tarkhan Gaziyev rescinded their bay’at to Umarov. They said their main grievance was that Umarov had suspended the Majlis al-Shura, the Emirate’s consultative council, and had formed the Caucasus Emirate without first consulting with other senior leaders. They declared that Gakayev was now the Emir of Chechnya and that they no longer recognized Umarov, asserting that the fighters in Chechnya supported their decision. In a second video, the three men reiterated their loyalty to Gakayev, this time alongside other commanders, suggesting that Gakayev’s faction wanted to refocus the Caucasus Emirate on Chechen nationalist concerns rather than Umarov’s pan-Caucasus global jihadi vision. Umarov responded not long after with a published decree eliminating the South-Western and Eastern Fronts, ordering all commanders to renew their bay’at to him, demanding Gakayev to hand over the money and supplies he’d been given, and giving Mukhannad one month to report to the emir’s “court” over charges he had fomented fitnah. Umarov also released a video denouncing all who rescinded their bay’at, saying they had lost their will for jihad. Complicating matters, online jihadi shayks al-Tartusi and al-Maqdisi issued fatwas stating that Umarov was the true Emir. The whole fight that reverberated over the Internet was for naught, though. After not hearing about the feud since October 2010, in late July 2011 the Kavkaz Center announced that the two groups had reconciled their differences through a Shari’ah court and Vadalov and Gakayev, as well as other commanders that previously rescinded their bay’at, renewed it. In many cases, these debates resolve themselves either through reconciliation, such as in the case of the Caucasus Emirate, or there is an evolution in thought whereby a particular position wins out and is accepted. Therefore, although there are many vigorous debates in the global jihadi community that take place online, in the long run one view prevails with the grassroots activists, while the other position is discredited and fizzles out. A slew of reporting in the last two weeks has provided what can fairly be termed conclusive evidence that multiple varieties and large quantities of Surface-to-Air Missiles (SAMs) have been looted from Libyan stores, and have made their way to the open arms market in the Sahel and West Africa. When this story was first reported by people like the first-rate CJ Chivers in March, and then later by Chad’s President Idriss Déby as well as Algerian officials, I expressed a certain amount of skepticism, in part because of the sources (one country with close ties to Qaddafi, another that was unhappy about the possibility of further instability in North Africa) and in part because of the lack of specific information on or investigation of the claims – namely, no one had actually looked at the weapons stores in question, no one had looked at weapons prices, and no weapons had been actually observed in the hands of non-state actors. So much for that. 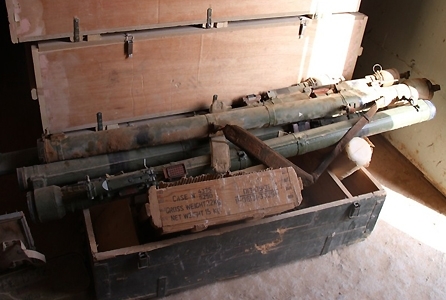 In mid-July, Chivers toured a weapons depot in western Libya and saw empty SA-7 boxes and other clear signs of departed weapons. Late last month, Kimberly Dozier and Bradley Clapper noted that the price of Man Portable Air-Defense Systems (MANPADS) were dropping in the region, a sign that the weapons had reached the market in sufficient quantity to make a noticeable difference. The EU counterterrorism coordinator Gilles de Kerchove stated baldly that Al-Qaeda in the Islamic Maghreb (AQIM) was in possession of a number of missiles (though this is a claim that other officials have been making since April). And now that the security situation in Libya is more stable, Human Rights Watch and other observers are remarking on the massive flow of weapons; Ben Wedeman quotes HRW’s Peter Bouckaert as saying that he’s seen cars “packed” with SAMs, and writes that not only the decades-old SA-7 but the more advanced and longer-ranged SA-24 missiles are missing. Unsurprisingly and not for the first time in the past several months, governments are concerned about the potential for the use of these missiles against civilian aircraft. France, in fact, dispatched police officers to airports in Niamey, Nuakchott, Bamako and N’Djamena back in June to reinforce airline security, though I imagine these officers are considerably more “specialized” than your average beat gendarme. But as I have noted before, I do not necessarily think the greatest threat from these weapons is to civilian planes. To be sure, the sheer number of missiles that may have gotten loose is staggering, given Qaddafi’s procurement over the years, and the higher capability of missiles like the SA-24 mean they pose a real threat to aircraft in and even potentially beyond the region. However, there are thousands of SAMs out in the open already, and past concerns about even advanced weapons like the Stinger have proved overwrought. After all, many of these weapons have a short shelf life, and as Twitter users @wjrue and @SahelLakes pointed out to me earlier today, these weapons may not have been maintained for years, and are difficult to keep operating in a harsh environment like the Sahel. But my hunch is that if these missiles make an appearance in something more than a propaganda video, it will not be Algiers, Abuja, or Paris, but will instead be somewhere along the Mali-Mauritania border. In June, when Mauritanian forces (with some Malian assistance) cleared AQIM forces from the densely-wooded Wagadou Forest, they made surprisingly extensive use of aircraft to strafe and bomb elements of the militant group, namely the Embraer Tucano. While the Mauritanian Air Force is quite small and only has a handful of the planes, they have become an important part of Mauritanian cross-border raids targeting AQIM. And reports have indicated that since June, AQIM forces have been trickling back into the Wagadou Forest, while another round of fighting between Mauritania’s army and the group looks increasingly likely. If the slow-moving Tucanos make their appearance in combat again, they would make a very attractive target. Of course, it is impossible to predict what may or may not happen with these missiles as the spread out away from Libya and how many will actually end up in the hands of militant groups. But when considering future risks, analysts may want to think less about Mombasa, and more about Mali.